I will be out of town next week, so there will be no page. However, I’m going to pre-load a few pieces of guest art done by other webcomic creators for you to enjoy! 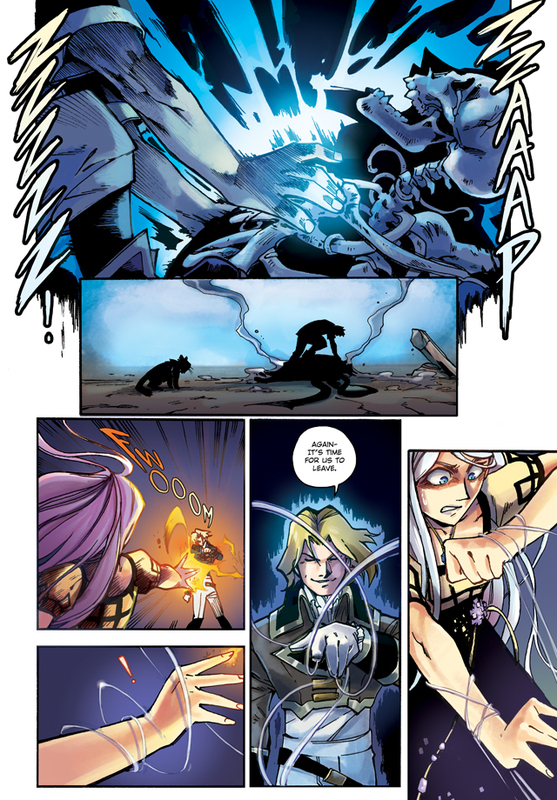 This page was guest coloured by Julie Wright of Riven Seal. Why? Well, because we are looking at the option of hiring a colourist onto our team, and have made a patreon milestone to reflect this goal. The goal to have colour pages all the time is $500, and we are currently at $308 in support. Doable? I hope so! You can look forward to a few more trial pages. Please consider contributing if you can spare a dollar or two towards production! I know, right? It’s a cold day when Accel’s actually taken somebody down and Faye’s got herself caught. Well, it’s a pretty cold day in Antarctica right now… :( I suspect we readers are going to see a plot twist we really don’t like: Accel smoking Daddy Dearest and Faye taken captive. Savannah, I know that grin. That’s the, “Oh, they have nooo idea.” grin… So now you have me all excited. More color is more awesome! And I swear, if Felix doesn’t go all Bond-villain on us, I’m gonna tear what’s left of my hair in frustration; I REALLY wanna know what he’s planning! The suspense is so thick I need a chainsaw to cut it! Behold, a truly dubious yet strangely appropriate Amazon kitchen appliance link! Note North american electrical standards are if it can survive a lightning bolt strike it’s good. Sadly Accel’s dad 2.0 did not meet these standards upon testing. Well, we never did see a UL* seal. *Underwriters Laboratories, a testing institute that insurance companies use to set safety standards for electrical consumer products. Color is spectacular. But what happened in the 3rd panel? I thought Faye was much closer at last sighting. Felix was moving backwards when we last saw him, or so I surmise. Otherwise he’d have been toast already. Now would be a good time for Kaden to Shoot him! Just what I thought, only isn’t Kaden still a bit busy right now? That depends, did shirtless surrender with Samantha and Leon two comics ago? I’m not sure if we know that yet. True, but maybe those cords restrain her from lighting the fuse, as it were, in addition to (it would seem) capturing her for transport. Felix, you are SO ANNOYING! Great page! It’s too bad for Accel that, even when he’s awesome and doesn’t miss his target . . . he still misses. :’) Better luck next time, Accel! He just can’t resist the smug grin, can he?